This page arose from my search for a reference on the various collections of Coins and Medals issued in conjunction with the United Nations and the Food and Agricultural Association. - Other U.N. Medal Collections. - Unofficial: Seven Seas (1972). For individual coins and contact information see my homepage www.fiat-panis.de (in german language only). Much of the information on these pages I have copied from Arthur Newmarks homepage, available under fao-coins.info until December 2016, who was contributed by collectors around the world. I thank those many contributors and welcome additional information on these series. The list of countries need to be updated. Please let me know if you are aware of any additional countries that belong on this list. These brochures illustrate the issue prices for the FAO Albums, Boards and medals through 1978. 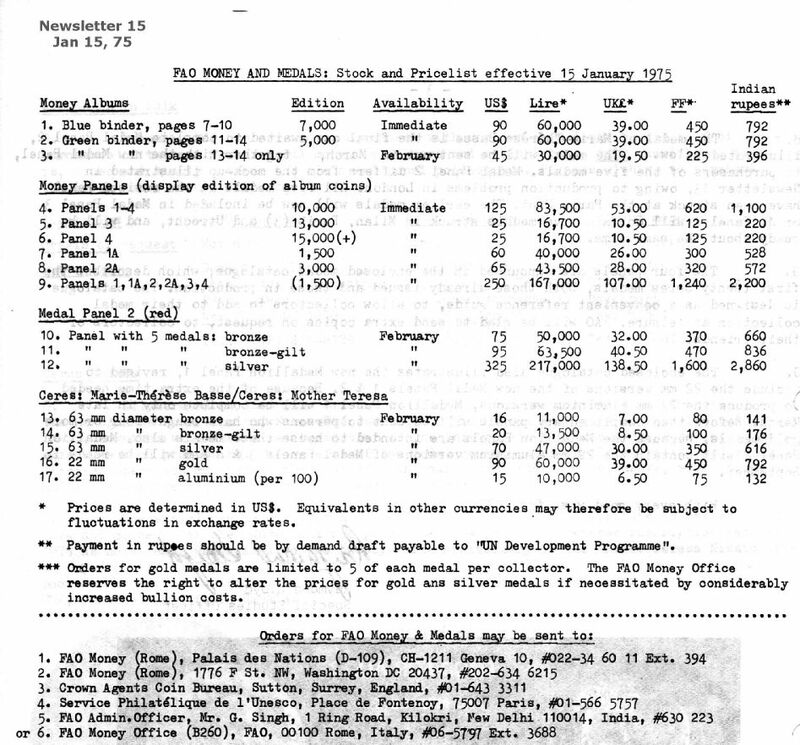 Newsletter 17 - 1/21/1976 - Issue prices for Green Album 3, Grey, Album 4, "FAO Coins of the World" see ¶ 6. 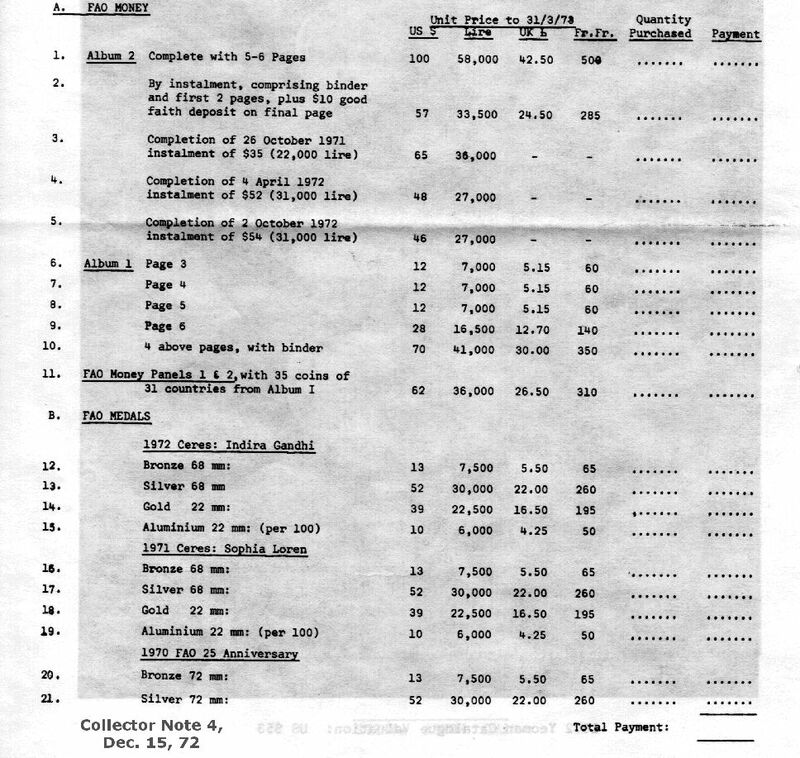 Newsletter 19 - 8/30/1976 - Issue prices for Album 2, 3, 4, 5 Money Panels, 1-5, 1A, 5, 6, 3A, 4A; Ceres medals First reference to Panel 1B. Newsletter 23 - 5/12/1978 - Announcement of Money Panels 10-12 / Red Album 7 - Album 7 was issued with the same 48 coins as Panels 10-12. Newsletter 25 - 6/29/1979 - New Distributor - International Coins and Currency; Montpelier, VT Announcement of 3rd edition of Medals Booklet. Newsletter 27 - 4/21/1980 - FAO Red Albums - First gold coins; "90 participating countries"
1977 Distributors of FAO Money and Medal Pages. 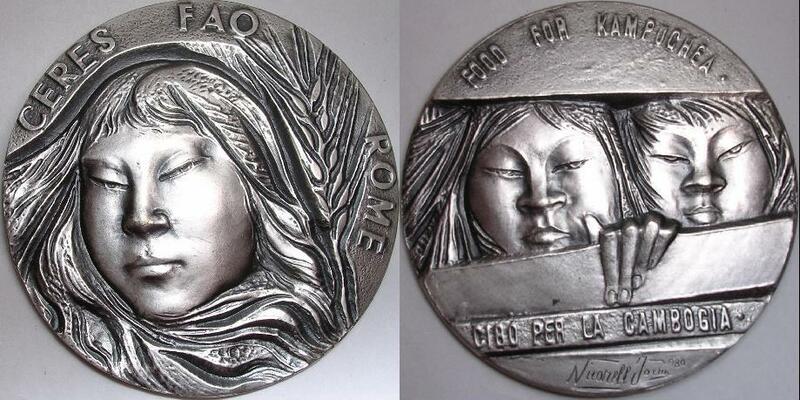 being issued from FAO headquarters in Rome. I thank him for the wealth of information he has contributed to this page. German FAO coin catalog Written by: Rainer Erdmann; Fulda; Germany Catalog is sold out! Only 500 printed. World Fao Coin Book - According to Juan - THE work on the subject - I have not bee able to find this book. for the Isle of Mann, with a "PM" mintmark missing from the reverse. of coins with the initial pre-production setting up of dies prior to the circulation mintage. Clearly, a "pre-production" batch of these pieces was released to the FAO MMP. It is unclear if any of the "normal" pieces made it into the released collections.